Please remember to lower your flags to half mast in honor of the innocent American lives lost and sacrificed on that horrific morning 11 years ago. About the time of the crash, air controllers noticed that Flight 175 fell off the radar. And a few minutes later, they learned that Flight 77 had been hijacked. It was then that they then suspected that Flight 175 had also been hijacked. In fact, both pilots on board that plane had already been stabbed to death. At 8:55 am, Karl Rove took President Bush aside and told him of the crash at the North Tower. They were headed to an elementary school in Sarasota, Florida. At first they believed it was likely an accident, perhaps a pilot who had suffered a heart attack. The death toll from the South Tower was far lower than in the North Tower because when the occupants learned of the attack on its neighbor, about 2/3 immediately evacuated the building. The combined death toll from the two towers was estimated at 2,606. 60 people perished on board Flight 175. 343 first responders – firefighters and paramedics – would also perish. And 23 officers of the NYPD as well. Firefighter Terence Hatton — who earned 19 medals in 21 years — died before his wife even had the chance to tell him that she was pregnant. At least 200 people fell or jumped to their deaths from the burning towers. We remember the footage of people gathered in groups at the windows in a last minute attempt to get some oxygen. We remember many of them jumping in order to avoid a fiery death. The reporters called them “jumpers.” We can’t imagine being faced with such a hopeless choice. Our hearts ached as we watched the footage. At the time the second plane struck the South Tower, President Bush was in a second grade classroom promoting his education policy and listening to the children read a story about a pet goat. At 9:06 am, Chief of Staff, Andrew Card, seized a pause in the reading exercise to whisper to him that a second plane had crashed into the Towers. President Bush continued briefly to listen to the children read their story so as not to relay any sense of alarm to them and in front of the cameras. At 9:16 am, the FAA learned that Flight 93 might also have been hijacked but could not get confirmation. At 9:20 CNN and Fox News commentator, Barbara Olson, a passenger on board Flight 77, called her husband, Ted Olson, Solicitor General at the Justice Department to tell him that the plane had been hijacked and that passengers were ordered to the back of the plane. The FAA then learned that Flight 77, originally en route from Dulles Airport to Los Angeles, had circled around and was heading towards Washington DC. At 9:28 am, the hijackers on board Flight 93 took out knives and stabbed pilots, flight attendants, and passengers. Then they relocated the remaining passengers to the back of the plane and threatened to detonate a bomb. Air control was able to hear Arab voices on the radio. At 9:34 am, the FAA noticed that Flight 77 was missing. It had dropped from radar. At 9:36, it crashed into the first floor of the Pentagon, along the west wall. All 64 people on the plane perished and 124 people working in the building were killed. A further victim would die in a hospital several days later. Donald Rumsfeld ran from his office on the other side of the Pentagon and went immediately to the crash site. He helped carry victims on stretchers and helped medics set up IVs. At 9:42 am, Mark Bingham, on board Flight 93, called his mother and said, “I’m on a flight from Newark to San Francisco and there are three guys who have taken over the plane and they say they have a bomb.” He didn’t stay on the phone long, but he repeated several times: “I love you Mom. I love you very much.” Fellow passenger, Todd Beamer, was able to make a call for 13 minutes, to a GTE customer service supervisor, who then immediately notified the FBI. He said that the plane was hijacked by 3 people and they killed the pilot and co-pilot. He said the hijackers had locked themselves in the cockpit and appeared not to know how to fly the plane. Whether they realized it or not at the time, Mark and Todd both attended the same high school – Los Gatos High. They were both athletes. Flight 93 was en route at that point for Washington DC. F-16 fighter jets were in the air, tracking it and poised to shoot it down. At 9:59 am, eyewitnesses at Ground Zero heard a series of loud explosions and then the unimaginable happened… the South Tower collapsed. At 10:06 am, Flight 93 began to break up in mid-air before it finally crashed into an empty field in a place called Shanksville, about 80 miles southeast of Pittsburgh, and about 124 miles or 15 minutes from Washington, D.C. Debris was found very far away from the crash site and in fact, very little wreckage was found there. All 40 passengers were sacrificed. Mayor Guiliani was asked how many had died and he answered: “The number of casualties will be more than any of us can bear. 2,606 people died in the towers or on the ground. The death toll could have been much worse. An estimated 15,000 people made it out of the World Trade Towers to safety after the first plane crash. 246 people on the four planes died. There were no survivors. The hijackers turned our beloved Twin Towers into slaughterhouses. Shortly after the towers fell, Kevin Shea, an off-duty firefighter, was found on West Street, with a broken neck, severed thumb, internal injuries, and very little memory of what he had done as the buildings burned. He suffered slight amnesia but was keenly aware that 12 other firefighters from his fire company who raced to the World Trade Center never made it out alive. Firefighter Anthony Sanseviro was in tears, mourning the death of his longtime friend and fellow firefigher Danny Suhr, who was struck by a falling body and killed as they were running to the burning towers. At 3:15 pm, President Bush had arrived back in DC. Condoleeza Rice greeted him with these words: “We’re at war, sir.” Bush asked CIA Director George Tenet who he thought was responsible for the day’s attacks and Tenet replied: “al-Qaeda. The whole operation looked, smelled, and tasted like bin Laden.” Tenet then told him that passenger manifests showed that three known al-Qaeda operatives were on board Flight 77. At 8:30 pm, President Bush prepared to address the nation – to address 320 million Americans who had witnessed an unspeakable tragedy. He gave these words: “Today, our fellow citizens, our way of life, our very freedom came under attack in a series of deliberate and deadly terrorist acts. The victims were in airplanes or in their offices: secretaries, business men and women, military and federal workers, moms and dads, friends and neighbors. Thousands of lives were suddenly ended by evil, despicable acts of terror. The pictures of airplanes flying into buildings, fires burning, huge — huge structures collapsing have filled us with disbelief, terrible sadness, and a quiet, unyielding anger. These acts of mass murder were intended to frighten our nation into chaos and retreat. But they have failed. Our country is strong. A great people has been moved to defend a great nation. Terrorist attacks can shake the foundations of our biggest buildings, but they cannot touch the foundation of America. These acts shatter steel, but they cannot dent the steel of American resolve. America was targeted for attack because we’re the brightest beacon for freedom and opportunity in the world. And no one will keep that light from shining. Today, our nation saw evil — the very worst of human nature — and we responded with the best of America… with the daring of our rescue workers, with the caring for strangers and neighbors who came to give blood and help in any way they could…. Today – 10 years later – we stand here not as Men or Women, Young or Old, Rich or Poor, or members of any ethnic group. We do not stand here as laborers or professionals or housewives or public servants. Or as Christians or non-Christians. We are Americans. On the morning of 9/11, our enemies didn’t target any one group over another. They targeted Americans. Firefighters and other first responders risked their lives to save those dying and in danger.. They didn’t see the scared and suffering in terms of race, religion, gender, or profession. They simply saw them as fellow Americans. 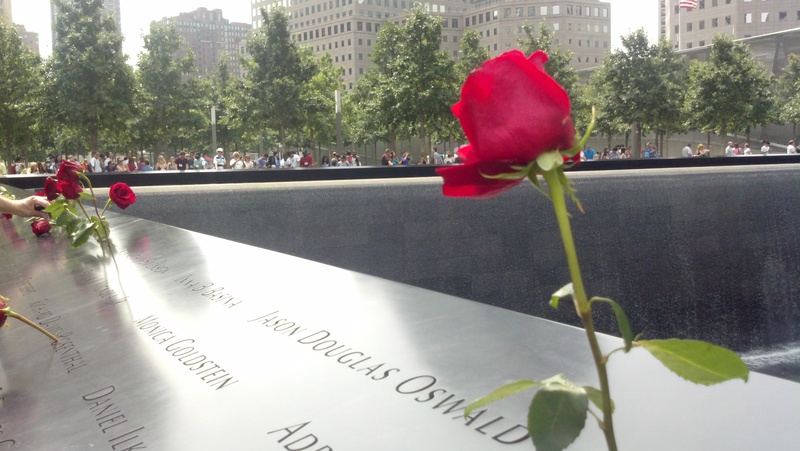 The spirit that the terrorists tried so hard to kill on September 11 has never been stronger. The attacks only solidified our commitment that America will survive and freedom will ring. The attacked forged a new generation of patriots. Men and women have been inspired in force to join the armed services. Over 3 million have volunteered. Today is a day to remember the attack on our country, the overwhelming response by first responders, and the tremendous outpouring of support and love for fellow Americans. Today we honor those who died for no reason other than they happened to be where they were on that morning. The display of the flag at half-mast, the participation in remembrance services, the watching of footage on TV, and the saying of prayers is about respect and an unspoken duty to keep 9/11 from fading in significance. It’s about a solemn promise to fellow Americans to keep their spirit and sacrifice alive. As Scottish poet Thomas Campbell wrote: “To live in hearts we leave behind is not to die.” 3000 unarmed, innocent Americans were targeted for death in NYC and Washington DC because they were Americans. It could have easily been my husband or my child who was on one of those planes, or your husband, wife, or child. Today we renew our respect for firefighters and others who quickly and unconditionally respond to emergency and tragedy. We recall the contribution from the brave firefighters who lost friends and family and even their own lives. We thank the clergy who performed last rights and comforted those who were injured and dying. Their words and presence meant more than we can ever know. 343 firemen and paramedics lost their lives on that fateful morning. They crawled up fiery blackened, smoke-filled staircases to save complete strangers… And they willingly did so. We have such fondness and respect for our firefighters. They are a special breed. You see, the death card is one that every firefighter carries in his hand. He hopes he never has to play it, but it’s always there. Every time we hear a siren or a fire truck wail, we instantly know that a life will be saved. Sadly, we never know if the fireman’s life will be sacrificed. As we recall the barbaric events of the morning of 9/11 and the human tragedy that unfolded before our eyes, and as we participate in remembrance services, we look for the soothing words that only members of the clergy can deliver. Reverend Michael Bresciani said: “If a hundred clergy were called to pray at the ceremony they could do nothing to bring back those lost in the 9/11 attack.” But it would have been an act of respect, of consolation, and above all, a welcome reprieve from the indignations the families have already endured (including the fact that certain perpetrators of 9/11 have yet to be brought to justice, let alone even tried, a triumphant mosque near Ground Zero that is moving forward in its development, and an atheist suit that has been filed to remove the cross – a remnant from the crumbled towers – that was intended to be part of a memorial display). People look to clergy for comfort and empathy, and in fact, it was in this very capacity that Father Mychal Judge, chaplain of the NY Fire Department, lost his life at the site of the flaming Towers. He was in the lobby of the South Tower administering last rites when it collapsed. Debris flew everywhere, striking Father Mychal in the head. It was reported that at the time he was struck, he was praying out loud: “Jesus, please end this right now! God, please end this!” When I was in high school, Father Mychal served at St. Joseph’s parish in my hometown of East Rutherford, in north Jersey. I was in a youth group at the time. It is said that the test of any religion, government, political system, or educational system is the type of man or person that it forms. Let us think about that as we reflect on the events of 9/11 and let us hope that the events of that day will forever inspire us to put forth the best leaders in the world, committed to freedom, peace, and security.